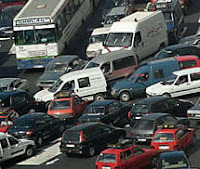 A few years ago, while I was in the middle of Casablanca gridlock, I spotted a shortcut going off to the right. I didn’t know where it went, so I swerved and accelerated up a narrow alley, which tapered as it went. The thing about Casablanca shortcuts is that you have to surge up them fast, foot flat down. If you don’t, then all sorts of traffic hurtles toward you in the other direction – cars, trucks, carts, bikes, trikes, blind men, wild dogs, donkeys, geese, chickens… everything you can imagine. So I was careering up that alley, teeth gritted, face in a frenzied snarl, and then I saw it: a panel of the finest geometric wrought iron work I had ever seen. I went in, my eyes adjusting to the darkness. I scanned the place. There were three or four anvils, odd lengths of metal, a heap of wrought iron, the stench of sulphur and of coal and, in the dingiest corner, the shape of a man. 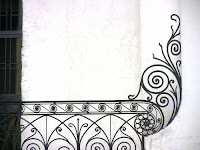 Nudging a hand out into the sunshine, I motioned towards the panel of geometric ironwork. That was seven years ago. And in that time Mustapha the ferronier has become a huge part of our lives. Whatever we need made, he will do it, and he’ll do it with a touch of genius. I would give my front teeth to have skill like that, mixed with a gentleness, a calmness, that allows the mind to spark, and brilliance to unfold. Mustapha likes to work at the end of the garden on a patch of empty land. His tools are almost non-existent, little more than a hammer, a ruler, a file and a welding torch. I often find myself concluding that he’s a magician. I’ll go down and check how he’s doing, only to find that the work hasn’t yet begun. But then, checking the next day, it’ll all be finished, with Mustapha sitting beside it sipping a glass of sweet mint tea. Last month I copied a page from a book of geometric designs. Mustapha is far too polite ever to complain, and very modest in every he does. But I felt he needed something extraordinary with which to show off. He looked at the page for a full minute, his eyes tracing the interwoven lines. A grin gradually moved from the left corner of his mouth to where his front teeth had once been. ‘Pas de problem, Monsieur,’ he whispered. A month later, a gate appeared, just like that — painted black and perfect. The great master craftsman handed me back the photocopy I’d given him, all soiled with dirt. ‘You’re a magician,’ I said. The ferronier looked at the paper, then gate, then me. Stroll down the long palm-lined Boulevard Mohammed V, the heart of old Casablanca, and you have to squint to appreciate the glory of it all. On the surface it may appear more than a little tatty at the edges but, look beyond the obvious, and you slip into a Twilight Zone of utter enchantment. Laid out by the French a century ago, the old crumbling downtown was once a showcase of imperial might, one of the first cities planned by aeroplane. 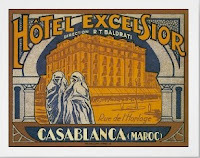 A gleaming jewel of Art Deco style, pre-War Casablanca was synonymous with all that was dazzling, exciting, and new. Back then, the chic restaurants and cafés were packed with men in trilbies, their women in long silk gloves and heels. These days, a façade of grime may cover every surface, but the magic’s still there, waiting to be revealed. And, more to the point, change is afoot. The phoenix is about to rise from the flames once again. A stone’s throw from the Central Market, a farrago of fresh fish and hopeful cats, a pair of wizened old pied noir take coffee on the pavement outside Le Petit Poucet. The syrupy morning North African light bathing them in shadows, they reminisce of how things used to be. Across from him, François sips his coffee and scowls. ‘The city was in full bloom back then. It was a fragment of paradise. The Frenchman frowns at the question, as the ancient waiter shuffles forwards with fresh glasses of ubiquitous café noir. 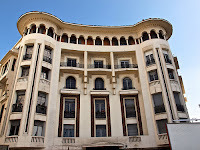 In the seven years I have lived in Casablanca, I’ve discovered the secret Art Deco splendour, an understated opulence shunned by almost everyone. The grandeur is everywhere… in the detail. Amble through the backstreets off the main boulevard, and you can’t help but notice it. The marble foyers are adorned with the finest quality brass-work, parquet, and wrought-iron, the curved lettering outside each building hinting at a time when Casablanca was wealthy in the extreme. There’s a sense that this wasn’t just another city, but a statement. The French constructed every inch with abounding national pride. In their legacy there’s a smugness, as if the streets of sleeping buildings know full well how extraordinary they are. But, despite the grand pedigree, modern Casablanca has lost its identity, and the glorious downtown has paid a heavy price. Fifty-five years since the colonials packed their sea trunks and left, the ‘Moroccan’ Casablanca continues to percolate forth. In some ways it’s the perfect balance, a realm with plenty of slack in the system, where nothing’s taken very seriously at all. The Art Deco Stade Velodrome is a case in point. With no need for a cycling track any longer, the 1930s stadium is used for nocturnal greyhound racing of an uproariously sleazy variety. The preserve of Moroccan Del Boy Trotters, cloaked in thick woolen jelaba robes, they turn up nightly to swap tall tales and to blow the family’s savings on the dogs. Not far off, with their sleek curved lines, cupolas, and floral motifs, the majestic old apartment blocks of Mers Sultan are as impressive as anything you might find at Miami Beach. Once a posh residential quarter, Mers Sultan is avoided by the nouveau riche and by the few tourists who brave Casablanca. It’s a treasure trove of buildings that are themselves the epitome of faded grandeur. My favourite is the Café Champs Elyssée. A great rollicking rollercoaster of a building, fashioned in the shape of a luxury cruise liner, it’s filled morning till night with regulars, most of them tired old men hiding from their wives. Nearby, across from the Art Deco Cinema Lynx, is the iconic Bar Atomic. Dating from the ’thirties, when anything with the word ‘atomic’ in the title was regarded as racy and cutting edge, it’s one of a kind. Behind the bar, the bottles of cheap Flag Special beer are kept cool in the original wooden fridges, the speckled granite floor hidden beneath a layer of sawdust. Every few minutes a flurry of hawkers bluster in, touting everything from peanuts to underpants, to back-scratchers, toothpaste and shoes. Most days of the week Salah couches outside, selling cigarettes one by one. His face buried by scraggly white beard, his teeth mostly missing, he flutters a hand towards the street. In the distance, there’s a thunderous smashing sound which makes Salah cringe. Following the sound, I turn the corner to find an old Art Deco villa being reduced to rubble, by a team of men with sledge hammers, their bare backs gleaming with sweat. The fixtures and fittings are loaded onto a truck, which speds away to the junkyard up the road in Hay Hasseni. I recognise the driver, after all I spend half my life there, trawling through the wreckage hunting for gems. Go often enough and you can find roll-top baths with claw feet, wooden roller blinds, and fabulous washbasins the size of cattle troughs. But each cluster of baths discovered means another magnificent Art Deco villa has been ripped down. Live here long enough and it’s easy to be jaded and just a little bitter that no one seems to care. But the green shoots of recovery are all around. With the backing of the king, there’s a grand plan to revitalize the old heart of Casablanca, just before it ceases to beat. A tramway is being constructed, expected to be launched next year. 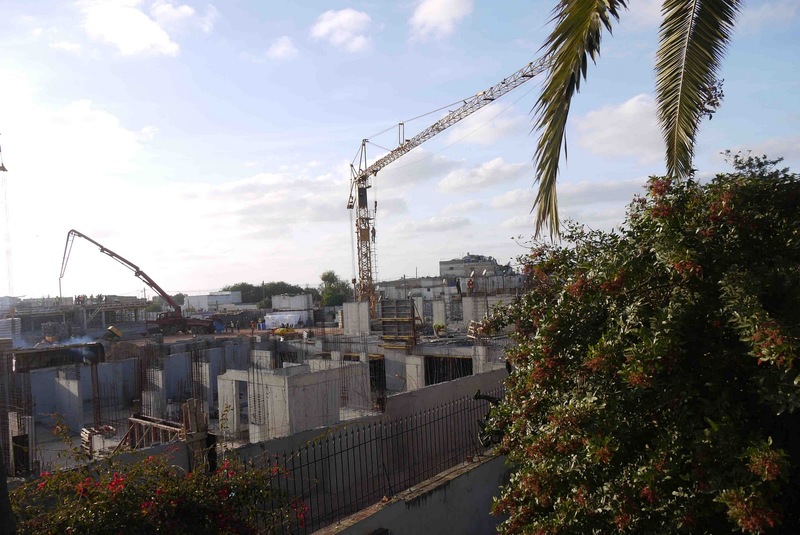 It will link the main thoroughfare Mohammed V to other areas of the city. After all, one of the great problems has been that the post-Colonial centre moved away to the chic new district of Marif. The master plan is to get investment downtown again, a long process that’s begun with cleaning up the streets and giving the grand old buildings a badly-needed lick of paint. 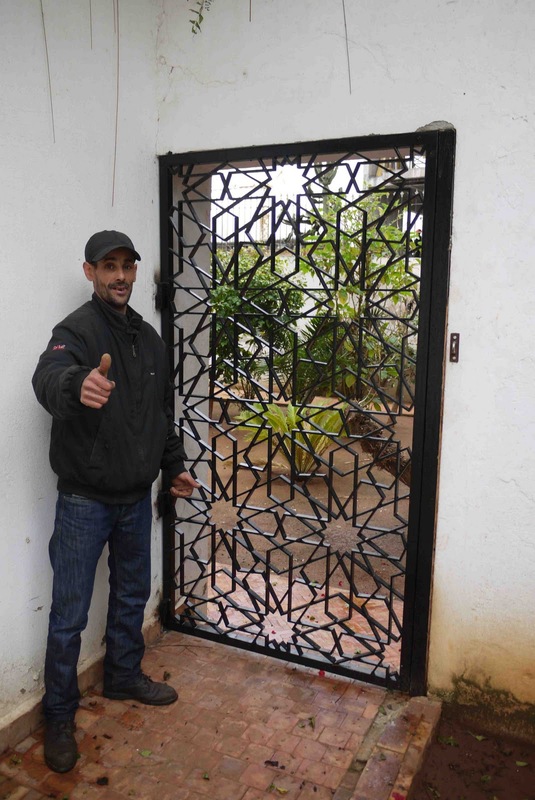 The most important change is that of the mindset, enthusing both locals and visitors about real Casablanca again. And, it’s happening. Precious Art Deco treasures are being restored on a micro scale – the engine of true inertia. One of the most impressive renovations is the boutique Hotel de la Doge. Tucked away in a narrow cul-de-sc opposite the imposing Sacré Coeur Cathedral, the hotel is a hymn to Art Deco style. The doors are festooned with curled wrought-iron, the furniture and fittings sculpted from sweeping lines. Named after famous celebrities of the time, the sixteen rooms and suites have been painstakingly adorned with period objets – all of them sourced in the city’s antique shops and flea markets. The result is a dream-like moment from Titanic, stepping into a pristine 1930s Casablanca. Back at Le Petit Poucet, Laurent and François have moved on to the house wine, and have knocked down a bottle each. Both at once they shake their heads in despair, take a sip and grimace. I nudge a thumb towards the newly laid tram tracks and the fresh whitewash. Laurent shrugs. François suddenly taps his watch. Round the corner, to Cinema Rialto. Laurent downs his wine in one. ‘Casablanca,’ he says, with a smile. With the noon sun above them, a circle of fifty people are standing in the centre of Jma el Fna, the magical heart of Marrakech. They’re packed in tight, shoulder-to-shoulder, necks craning forward, beads of perspiration on their brows. There’s a sense of raw anticipation, of wonder, an electric atmosphere, like the meeting of a secret fraternity. Push through them into the halka, the opening, and you glimpse the reason they’re there. Blindfolded, and with outstretched arms, a tall swarthy Tuareg named Abdul-Rahim, is on tiptoes in the middle of the ring. To the delight of the audience, he’s bellowing at the top of his lungs, as he recounts a tale of war and love from A Thousand and One Nights. A storyteller by trade, Abdul-Rahim’s profession is as old as the square in which he performs – day in, day out. 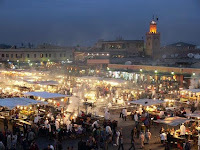 Its name translating as ‘the Place of Annihilation’, Jma el Fna is where ordinary Moroccans come for food, for healing, but most of all, for entertainment. Along with the labyrinth of streets that form the medina behind it, the square lures locals and visitors alike. A natural balance to one another, they were once part of a distant desert oasis, the spot where the seed of Marrakech fell centuries ago. These days getting to the red city is simplicity itself. Low cost airlines ferry tourists in from Europe and beyond. 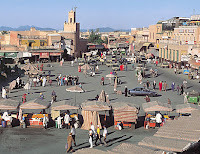 But, despite all the visitors, Marrakech has retained the allure that’s made it such an iconic destination. 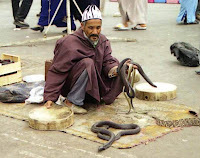 No one who’s ever strolled through Jma el Fna can forget its eclectic stew of humanity – the snake charmers and tumbling acrobats, the medicine men and blind men, the madmen and doped out hippies and, of course, the storytellers like the inimitable Abdul-Rahim. Sponging a rag over his brow, he calls out for the audience to come back that evening when the heat has waned. How does he know they’ll come back? The storyteller grins expansively at the question. To the left of Abdul-Rahim squat a cluster of snake-charmers, the piercing hum of their rhaita flutes bewitching all who hear it. Draw near, and the serpents are knocked from their rest beneath a clutch of circular drums. Dazzled by the sudden blast of sunlight, a pair of spitting cobras rear up, poised to strike. Seemingly immune to the heat, their master is dressed in a thick woolen jelaba robe, a strand of ragged calico wrapped around his head. And around his neck – its tongue licking the afternoon air – is a frail water snake, a parched desert accessory. 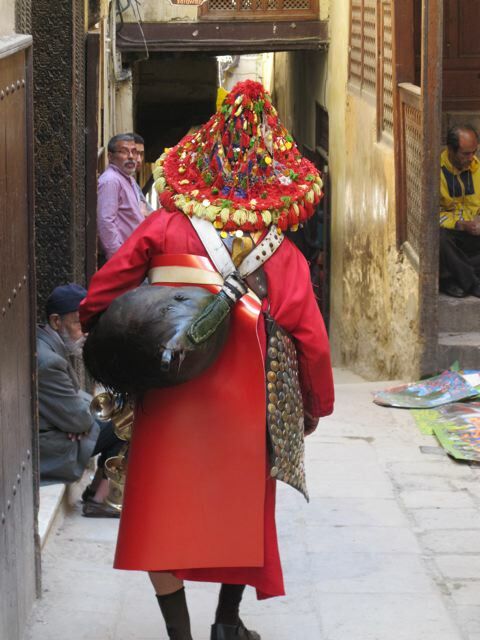 Slip out of the square, past the orange juice stalls, and the old men who sell cigarettes one by one, and you reach the cool sheltered lanes of the medina. On the corner stands a water-seller, his red shirt crisscrossed with bandoleers from which brass bowls are slung, his creased face shaded by a wide-brimmed hat from the Rif. Part tourist photo-op, part functional deliverer of sustenance through the scorching afternoons, the bright costume, the brass bowls, and dripping goat-skins, are synonymous with the red city like nothing else. With no paying takers, the water-seller approaches a pair of boys playing marbles in the dust. He fills a bowl for each of them, urging them to drink the crystal water, with the words, ‘Children are a blessing from God’. With the light filtered through latticework and the sound of the muezzin calling the midday prayer, there’s a sense of limbo – the long wait for dusk. Nearby, is the Fondouk Fteuh.A ramshackle caravanserai laid out around a central courtyard, its shops are packed with a hotchpotch of treasures and junk. Perched on a stool amid a sea of battered old pots, pans, brass lamps, scales, and vast copper urns, is Mustapha. Gently fanning himself with a dusty magazine, he rolls his eyes, takes a sip of piping hot mint tea, and sighs. ‘It will change,’ he says slowly. By late afternoon, the heat is suffocating, the sense of listlessness, extreme. Leaving his shop unattended, Mustapha ambles away for a shave. The medina’s streets are largely deserted, the shops selling tourist knickknacks closed up, their owners catnapping inside. The one stall doing brisk trade is serving up ample lunches. A row of workman are gorging themselves on individual lamb tajines, the conical pots steaming with juices. Circling their feet expectantly is a family of cats. A stone’s throw away is a great wooden door, lacquered dark with varnish, a fluted arch above it providing shade. Tucked away in the eaves are dozens of house martins’ nests. And, behind the door, lies one of the great jewels of Marrakech – the Kssour Agafay. To step across the threshold is to venture back through five centuries, the corridor spiralling upwards to a courtyard, itself open to the sky. The walls are adorned with hand-cut zellijmosaics, the floors laid in Andalucían tiles, and the magnificent doors comprised of geometrical fragments of cedar wood. The sound of water trickling from a central fountain mingles with the scent of jasmine, against a backdrop of sobriety – the kind only arrived at through the passage of time. As the afternoon ebbs towards evening, the medina emerges from its slumber. Within an hour, the shops are awash with people. There are tourists, of course, bargaining for all they’re worth. But, the further you get from Jma el Fna, the more ordinary the wares on sale. Twist and turn down the telescoping lanes, and you find a life that’s changed surprisingly little in centuries. There are shops touting simple wooden sieves and rough bellows, sacks of charcoal, salt, scrubbing brushes, and cones of sugar. There are plenty of trappings from the modern world, too – plastic buckets and cheap Chinese running shoes, satellite dishes, laptops, and mobile phones. Out in the square, the muezzin calls the faithful to prayer as has been done five times a day –every day – for a thousand years and more. Then, as the last strains of his voice melts away into the lengthening shadows, there’s a thunderous roaring sound. From all sides of Jma el Fna, carts come flying forward, like gun carriages rolling out to war. On the back of each one is a jumble of cast iron staves and struts, steel grills and trestle tables. Amid the deafening clatter of hammers, dozens of food stalls are hurriedly arranged. On the square itself, the crowds are gathering again. Families out for an early evening stroll take in the free entertainment. Among them, Abdul-Rahim goes on with his tale, rescuing his hero in the nick of time from the jaws of death. Behind him, a band of gnaoua musicians perform, the roots of their fraternity sinking deep into the African soil beneath them. A brotherhood of troubadours, dressed in desert robes, caps embroidered with cowry shells, they brandish karkabeb, great iron castanets. Across from them, there’s a troupe of acrobats in matching turquoise livery, tumbling and falling, then climbing each other to form a towering human pyramid. On the other side of the square, past a line of stalls selling snails in hot broth, and a huddle of fortune-tellers, another circle is forming. At the centre, there’s a rough-looking giant, a week’s growth of beard on his cheeks. He’s wearing boxing gloves, and is calling out for a brave man to take him on. All of a sudden a young woman strides up, puts on gloves, and throws a punch. To the delight of the crowd and, against all odds, she knocks the giant out. Over at the food stalls, a haze of oily smoke is billowing up, as the last throes of platinum light fade into darkness. Above each stall is a number, and in front of each is a hustler cajoling lobster-red tourists and local Marrakchis to come forward and feast. King of the Hustlers is a fresh-faced man of about thirty who goes by the nickname Denzil Washington. Waving a laminated plastic menu at anyone within striking distance, he yells out his sales’ patter: ‘One-one-seven takes you to heaven!’ Behind him is a Moroccan smorgasbord – sheeps’ heads and beef heart kebabs, spicy merguez sausages, oysters, scallops, and fish. With darkness descending, the food stalls take on an almost supernatural aura. Illuminated by electric lamps, bathed in smoke, and bustling with people from all walks of life, you can’t help but be sucked in. Back in Fondouk Fteuh, Mustapha is packing away his wares. When asked how much he’s taken, his smile disappears. On the stroke of midnight, there’s the whooping and hollering of a marriage party far away. Against the clattering of iron castanets and the heralding of trumpets, a bride is carried through the streets on a dais towards her awaiting groom. Elsewhere, the shops have closed up for the night. The water-sellers, the knife sharpeners, and the cigarette sellers, have all hurried off home. A stray dog is barking loudly, but no one gives a care. Most people are tucked away in the honeycomb of courtyard homes, watching Egyptian soap operas of which Moroccans are very fond indeed. In the square, over a bowl of thick harira soup Abdel-Rahim is counting his coins. At the next table is the boxing giant, his young female contender seated close beside him. In a ruse that’s misled countless audiences, they are father and daughter. Denzil Washington rubs his eyes and gives the signal for the stall to be dismantled. Like many Marrakchis, his days are long. By day he works in an orphanage, and hustles in Jma el Fna by night. The Marrakech night is punctuated by the occasional moped swerving loudly and lightless through the medina’s empty lanes. Then, all of a sudden, the call to prayer breaks the silence before dawn, and night slips into morning. Long before the shopkeepers have hung out their wares, it’s the time of the street cleaners. An army of them scrub where the food stalls had so recently stood, their hard-bristle brooms stripping away an evening of mutton fat. The medina too is given a hurried make-over. In the age of the boutique-style riad hotel, where every room has an en suite bathroom, plumbing’s a constant worry. Fifty years ago most buildings there would have been lucky to have a single loo. The majority that cater to tourists now have half a dozen or more. The result are clogged sewers, which are opened up in the night and cleaned. By sunrise, the scent of fresh squeezed orange juice wafts through the old city. There’s the aroma of m’simen too, and begrir, flour and water pastries, that form the backbone of the Moroccan breakfast. Stroll through the streets early and there’s not a foreigner in sight. In the wild rumpus of the Marrakech day, it’s those first hours that hold the most magic. The morning routine is a local one that goes unnoticed by most visitors. Donkey carts and bicycles laden with panniers restock the shops and market stalls. A woman and her daughter amble down their lane, plastic buckets and stools in hand. They’re off to the hammam. Coming the other way is a little boy, a wide wooden tray balanced on his head. He’s taking bread to the communal oven to be baked. By 8 am, the shopkeepers are sprinkling the street with water, keeping down the dust. Only when it’s quite damp do they begin the prolonged business of hanging out the wares, one which is re-enacted in reverse each night. At the same time, children hurry out to school in prim pinafores, book bags strapped tight to their backs. The souqs selling meat and produce are bustling by nine. Hordes of housewives are choosing live chickens, and selecting their vegetables one by one. 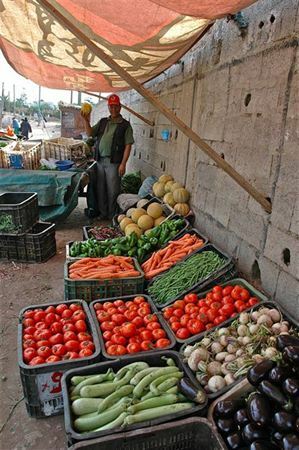 In Moroccan households, essentials are bought freshly each day, even now that most homes have refrigerators. Through the cool morning hours the most strenuous work is done. The dyers hang out their dripping skeins of wool; the blacksmiths pound away at wrought iron grilles; and the leather tanners beat the skins. Gradually, the tourists venture out from their cosy riads and explore, taking pictures of everything that moves. At the far side of Jma el Fna, Mustapha the shopkeeper is sitting at Café France, a day-old newspaper spread out between his thumbs. With business so slow, he doesn’t bother turning up until the sun is right over-head. A favourite haunt of Moroccan men, Café France is an institution, and has been for as long as anyone can remember. The waiters weave solemnly between the tables distributing clean ashtrays and glasses of tar-like café noir. By ten, M’barak, a magico-medicine man, is laying out his stall in the shadows across from where Mustapha is sitting. Dressed in the billowing indigo robes of Morocco’s south, his stock in trade includes dried damask roses and great lumps of sulphur, ostrich eggs, stork feathers, dried chameleons and hedgehogs, antimony, musk, and little phials filled with dark murky liquid. Of all the square’s healers, M’barak does the briskest trade. His popularity is due to the secret remedy he sells to those in the know. As soon as he’s ready, the customers start to arrive. Most of them men, they wave aside the treasure chest of obscure desert ingredients. ‘They come to me for this,’ M’barak says furtively, the glass phial catching the light. Pinching the end of his nose, he sniffs. 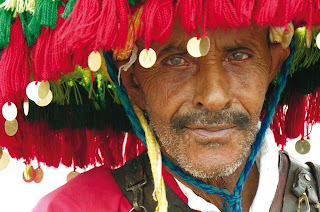 Beyond the snake charmers, the gnaoua, and the dentists touting second-hand teeth, Abdul-Rahim continues with his tale, the noon sun glaring down. With arms splayed upwards, and frothing at the mouth, he enacts the latest trials and tribulations in his hero’s life. The audience press in closer as the storyteller breaks into a whisper. Craning forward, they all gasp at once. A woman near the front suddenly begins to weep. Abdul-Rahim tugs off his cap and shakes it slowly from side to side. Read A Thousand and One Nights, and you learn right away that Morocco is a land of mystery and magic. Live here for any more than a few days, and you can’t help but be touched by the sense of the Supernatural. All devout Muslims believe in spirits called Jinn, or Jnoun. This is because they are described in the Qur’an. When God created Man from clay, He created a second life form from ‘smokeless fire’. The Occidental world gets confused when it comes to Jinn. They portray them as friendly, even loveable, spirits ready and willing to fulfil their masters’ orders. Or, they regard them as spirits of the deceased. In reality, however, Jinn are not ghosts, nor are they adoring servants crafted in the Disney mould. Like all Muslims, Moroccans believe that Jinn inhabit the world in a parallel realm laid atop our own. Sit in a cafe, and there could well be a Jinn right there opposite you. Walk down by the beach, and a Jinn may well be taking a dip in the water a few feet away. Just because you can’t usually see them, you might imagine they are not there at all. Much of the time, Jinn are quite happy enough living quiet, unassuming lives. But, get on the wrong side of one, and he is likely to tear you apart. Westerners visiting Morocco sometimes find it odd that the Moroccans they quiz remain tight-lipped when they broach the subject of Jinn. Regarded by all as extremely forbidding and serious, the Supernatural world is never taken lightly. After all, merely mentioning a Jinn can lead it to be summoned. For this reason, learning about Jinn is not only difficult but also potentially dangerous. As with most things in Morocco, the best way to learn is from the inside out. My own experiences with the Supernatural realm, and with Jinn, came about while renovating Dar Khalifa, our home in Casablanca. The house had been empty for years and as such it was widely regarded to be haunted, or rather occupied, by legions of malicious Jinn. The trials and tribulations of exorcism are described in my book The Caliph’s House. I have perhaps made lighter of the belief that I ought. For Jinn are a subject that’s woven into the fabric of Moroccan, and all Islamic, society. Making a careful study of their role within Islam is a way of glimpsing facets of Oriental culture that many in the West never quite realises exists. 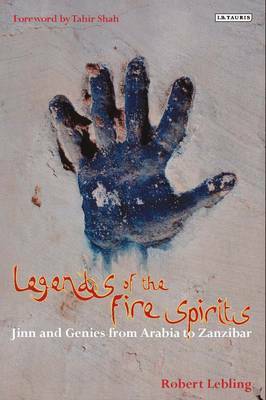 I recommend that anyone with an interest in learning more read Robert Lebling’s fascinating master-work on the subject, Legends of the Fire Spirits, for which I wrote a very modest introduction. In French ‘Bidonville’ means ‘Tin Town’, taking its name from the battered old oil drums (bidons), the metal of which has traditionally been used to make the shacks weatherproof. Casablanca is a wild and eclectic mix of housing. Near to where we live are some of the smartest villas in the city — even the smallest would go for well over a million Euros. Many are five times that. Other Moroccan cities have Bidonvilles, but few have them nestled so cheek by jowl with the more upmarket areas. Casa Trash, the dreaded nouveau riche, are embarrassed by the shantytowns, and will tell you that they are hotbeds of danger, dirt, and depravity. As anyone who has read my books will hopefully know, this perception couldn’t be farther from the truth. Living in the middle of Sidi Ghanem, the Bidonville that surrounds our home, has been more most rewarding and humbling experience imaginable. At first when we moved here, to live at Dar Khalifa, I looked at the situation in black and white. Come from the Occident and that’s how you tend to see things — good and bad, rich and poor. But Morocco is a realm of shades of colour rather than monochrome. And that’s where the true magic lies. The Bidonville functions in a very sophisticated way. There’s no crime to speak of, and most of the people who live here have some employment, many of them working in the surrounding villas as gardeners, maids and guardians. Their homes may look shabby on the exterior, but inside they are always neat, spotlessly clean, and welcoming. What has always impressed me is the way that the community works. If anyone’s sick or ill, friends, neighbours, or even strangers, watch over them. There’s a sense of fraternity that doesn’t exist in the fancier areas of town, such as Anfa, where the new money can be found. Walk through during any hour of the day and you’ll see women chatting on the main street, carts laden with pots and pans, fishmongers weighing out sardines, encircled by hopeful cats, and children scampering about between the buildings. There’s a sense that the streets are a grand sitting room, a place that belongs to everyone at the same time. The cornerstones of Moroccan life is very much in evidence — friendship, faith, and family. I’m not pretending for a moment that all’s well. Because it is not. Over the years we have been living here there have been mumblings from time to time about moving the Bidonville on and using the space for luxury. Once or twice there were even plans to bulldoze some areas. But then, at the end of the summer, construction began in ernest. The animals were moved first. They used to live in a great sprawling paddock of dust, donkeys, cows, geese, goats and sheep. Free-ranging and fabulous. The sound of the geese in particular formed a raucous quite musical backdrop to my working days. For six months the engineers have been toiling, building a series of plush apartment blocks on the far side of Dar Khalifa, homes for the wealthy that will — soon — overlook our lives. It’s not the high rise apartments for a new wave of Casa Trash that worries me, so much as what’s going to happen to the hundreds of ordinary people who lives in the Bidonville. Our maid, Zenab just told me that last week a man with a clipboard came round and asked her questions…. how much she earns, how many people in her family have jobs, and whether she has relatives elsewhere in town. She came to work this morning and broke down sobbing, damping her eyes with the corner of her headscarf.